Only four months until Christmas! 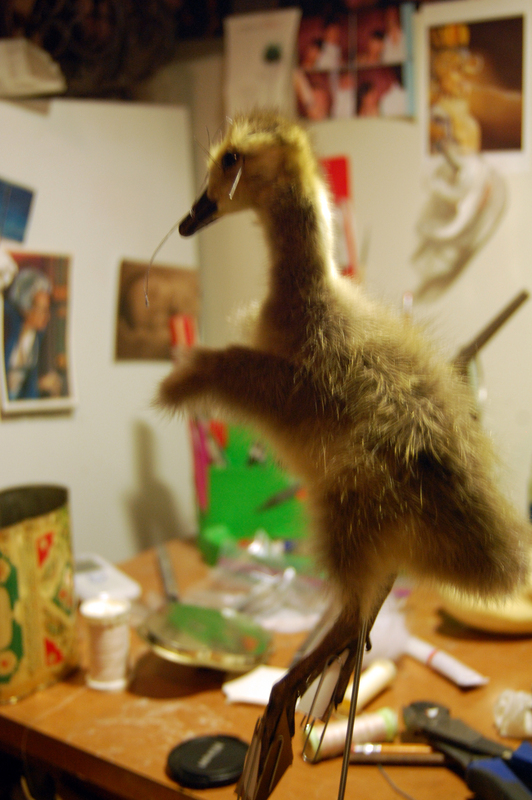 Operation gosling-tree-topper is in full swing and on I'm just about on the home stretch with this project. Dried and fluffed: that skin had to be one of the softest things I've ever felt. Part of me wished it was mine to use as I wished; I would've fashioned a pair of earmuffs out of it. While drying the skin I was presented with a new fronteir: molting. I had been completely unaware that birds went through this process until my friend Bailey the Hen-Master enlightened me to this phenomenon. While skinning the goose I'd noticed some skin peeling off his legs, not unlike a snake, but thought nothing of it. But when the downy feathers around his neck began falling out en masse while drying, I started to panic. 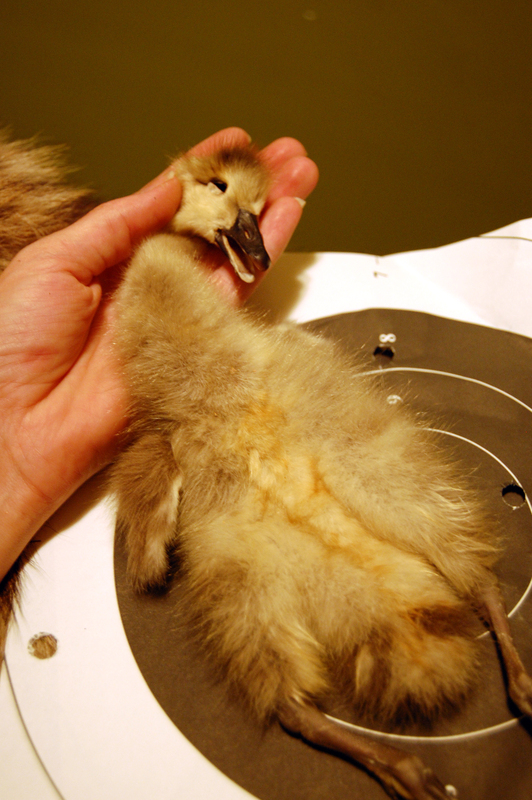 I looked up "goose molting" online and found out that young geese molt for the first time at 8-10 weeks, at which point their flight feathers come in. ( I also learned that geese are one fo the few monogamous species occurring in nature and mate for life.) Molting occurs annually and is a family experience. They try and stay close to the water at this time as an escape plan from predators, since they can't fly. Reading this, I was reminded of a night, weeks ago, when two friends and I were cutting through a field out in the suburbs to walk to another friend's house. There were geese everywhere and it looked like we'd just missed a giant pillow fight. Now I understand why. 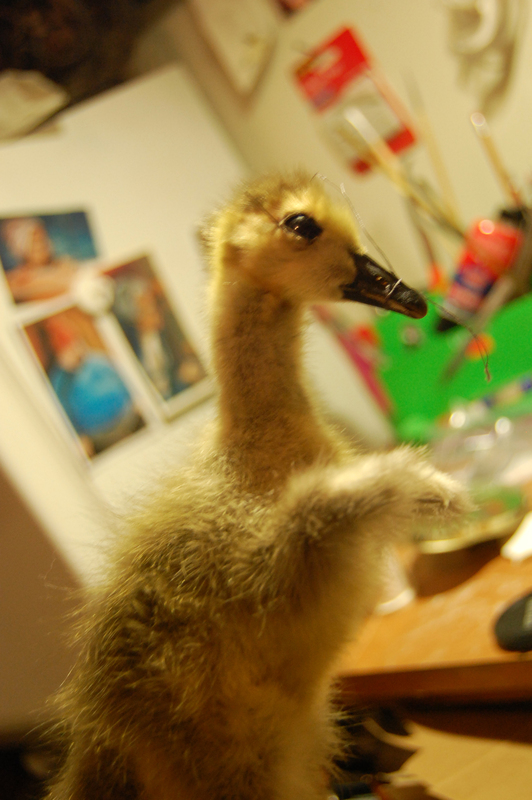 It's molting season, and Bobby the goose must have been just entering his first molt when he passed. I managed to handle the skin very carefully and keep the loss to a minimum. This was not an easy mount by any means; the skin was extremely delicate and I had to handle it with surgical precision to keep from losing any more feathers. The underformed wings presented a challenge as well, being completely new territory to me. Needless to say, once I had him sewn up and carded, my sigh of relief could be heard from blocks away, I'm sure. I've still got more to do, but I'm over the hump and quite pleased about it.